So after the Laugevegur hike came our roadtrip on Route 1, or mostly on that road (which is also called the Ring Road for obvious reasons) as we did stray a bit here and there. Below is a picture of it. 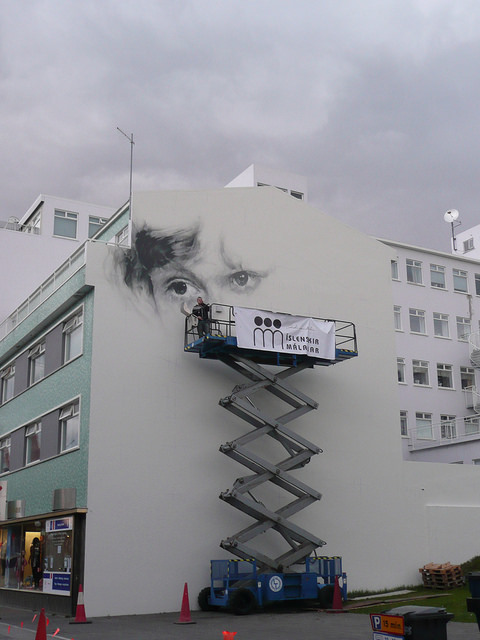 Reykjavik is at point 1 on the map and Hella is near point 7 to give you a bit of an indication. 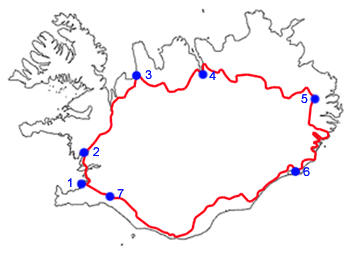 We would also be stopping near point 5 (Breiðdalsvík) and at point 4 (Akureyri) on the map. From Hella where we had parked the car pre-hike we drove to Vik but not before seeing some sights along the way. 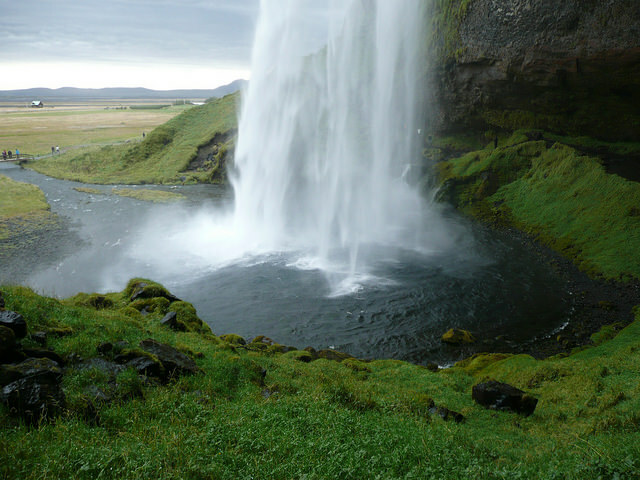 Which mainly consisted of waterfalls (or foss in Icelandic) like Seljalandsfoss. Seljalandsfoss is quite an amazing waterfall as you can walk entirely around it, getting entirely drenched in the process. Nearing the end of day the wind and rain picked up a lot and as we arrived in Vik, where we would camp for the night, we were glad to be able to camp behind a grass covered dune and some more windbreakers in the form of shrubs & trees. Showering at camp was somewhat of a hassle. Besides the floors being wet outside of the shower area, the shower only had two settings. 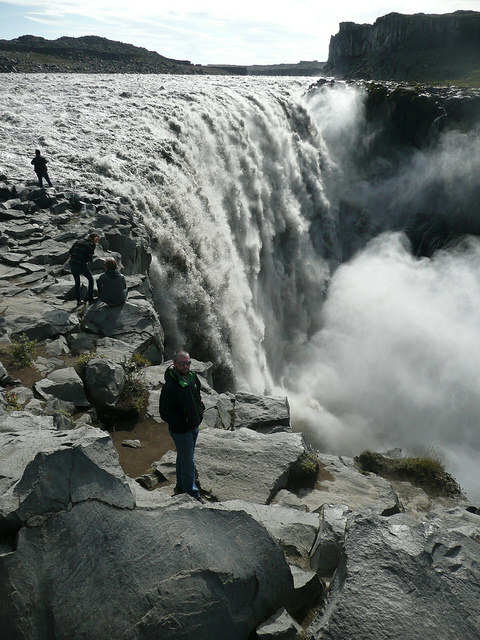 Hot, which tends to be very hot in Iceland as almost all of hot water is supplied geothermal vents, or extreme cold. Mixing both wasn't a option in this shower. Another thing you'll notice when in Iceland about the hot water is that it smells of sulfur (eggs). Not very annoying when it comes to showers but if you want to fill a bottle with cold water you should definitely leave the water running for a bit before filling it as that will help get rid of the smell. After getting my colleague's wonderful portable battery charger from the campranger's office, something I'll be buying soon as it is freaking handy to have on a holiday, we packed our tents and jumped in the car heading for the nearest petrolstation to load up on food and petrol for the car. I wasn't that accustomed to it but Chrissy & Adam dubbed this a "gasstation lunch", something that we would be doing a couple of times in the next few days. 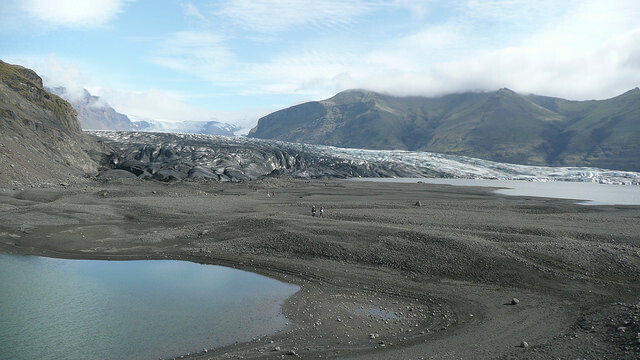 One of our first stops of the day was Skaftafell National Park and with that the Skaftafellsjökull glacier which is now part of Vatnajökull National Park. After a bit of a walk we got an amazing view of the glacier. Pressing on we reached the highlight of the day, Jökulsárlón. 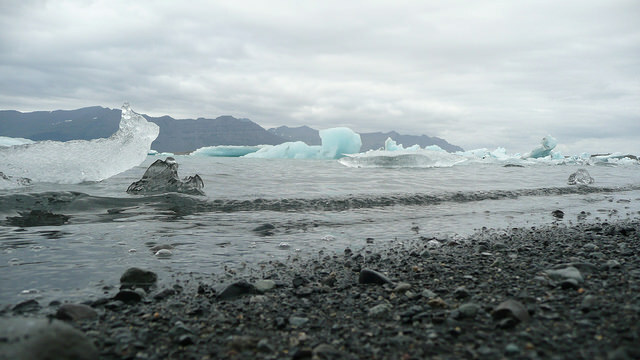 literally it means glacial river lagoon which, is spot on. No wonder that Adam opted to do the ALS icebucket challenge here, the hairy idiot. After a short exposure to the element for Adam we headed for our final stop before reaching our Hotel in Breiðdalsvík, the local booze shop. Here we grabbed some beers and Adam even arrange for ice and a cooler and as we had earlier agreed we stayed at a hotel for the night. I can recommend it! This gave us ample opportunity to actually take the time to shower and clean up for the first time since the start of our hike. Soon enough we started sampling the Icelandic beers we bought before we headed for the restaurant. Shamefully this was the only let down of the hotel experience as the pizza was definitely from the freezer and not freshly made. Bit of a sidetrack here but Adam introduced me to Untappd when we met in Reykjavik. A social beer app. Totally got hooked on it and if you're into special beers it worth checking it out. All the Icelandic brews I sampled have been checked in accordingly. All credits go to Adam for sharing Untappd. After a great nights rest in part due to intoxicity but mostly a comfy bed which was followed by a long shower, one of the best ways to wake up, I was ready for the second part of our roadtrip but not before scoring some breakfast which was quite good. Better then the pizza anyway. This day would bring us the most powerful waterfall in Europe. 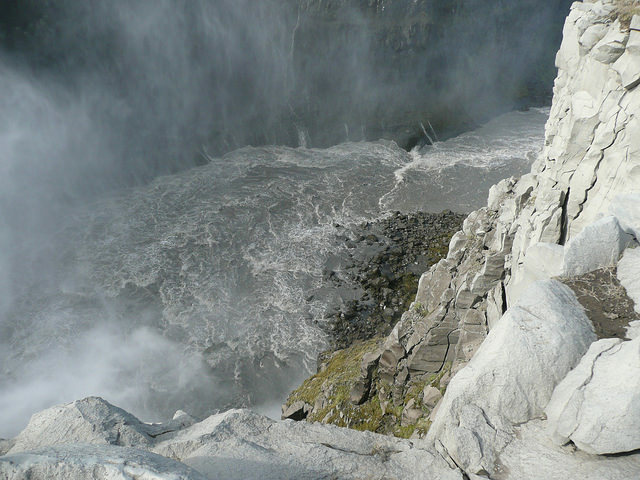 Also familiar as Dettifoss. Although the waterfall is in the middle of nowhere and it takes you a while to get there down a long dirt road it was totally worth it. It's a big waterfall indeed, just look how tiny Adam is in this picture. To give you a bit more of a clue how big it is, you should watch this video. Moving on we drove through some of the most desolate terrain yet and even saw some of the old road that was just besides the main road and must have been sitting there unused for years as it was already getting swallowed by the moss and grass. Nearing our lunch break for the day we had to cross another big expanse. For lunch we found a little bistro which served great food. I opted for roasted chicken salad and of course chocolate cake as desert. Most of our previous lunched had mainly been burgers, awesome burger true but still a man cannot live on hamburgers only, although I try my best to see if I could during our roadtrip. Our stop for this day was the harbour city of Akureyri, the Northern capital of Iceland. A really nice city with a European vibe to it. Feeling very cultured but that might have been the festival we kind of stumbled into. Although I've experienced second cities plentiful on my trips and even though Reykjavik might be better known I prefered Akureyri, just like I prefer Melbourne to Sydney and of course let’s not forget Rotterdam to touristy Amsterdam (mental note: blog about Rotterdam). 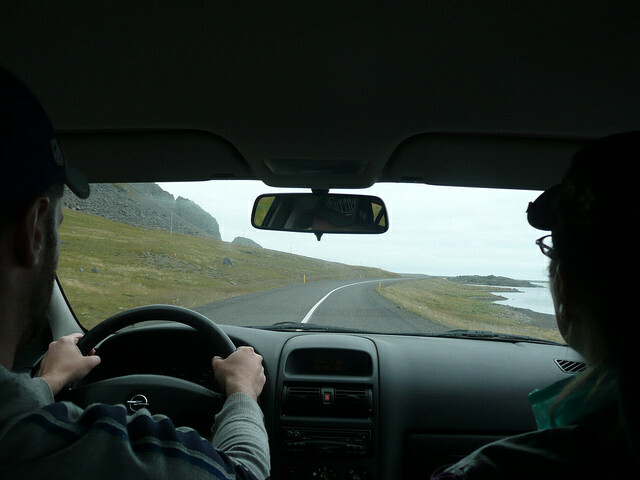 We headed for the city campsite, which every city in Iceland has, and before paying we hid Chrissy from the campranger in return for this we didn't have to pay for 3 people but just 2 (come on Iceland get with the per tent payment system already). After pitching our tents, Adam and I went for the local supermarket to grab some essentials like water, fruit and chocolate. 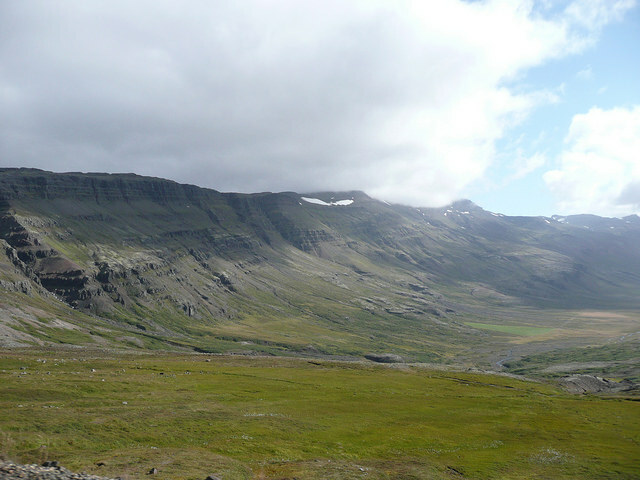 It was finally time to find out about the nightlife of Akureyri. We noticed that the city was still preparing for the festival while I made my best urban photo of the trip. After walking around for a bit we ended up in Götubarinn, a local bar that was deserted at time. Our 'personal' bartender informed us that it was still quite early for the normal crowd as they would probably still be pre-drinking at home. We got to talking with him and even got some advice about drinks and with it free drinks on occasion ranging from liquor to beer. 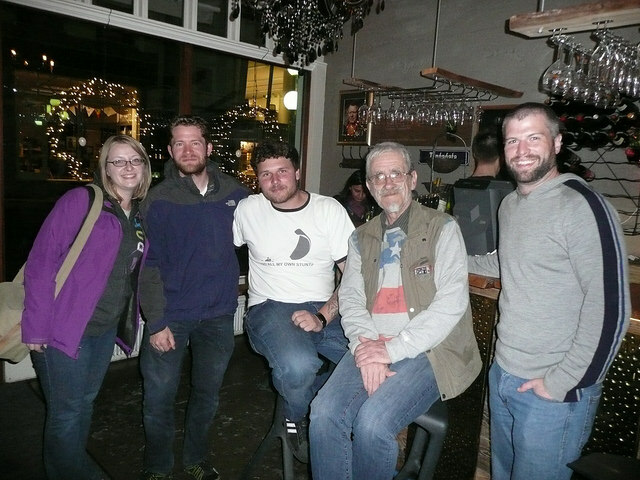 When the regulars started pouring into the bar we got to talking with some of them and as previous experiences have taught me this is when you get stories you keep with you for the rest of your life. This time we ended up meeting a German pastry chef called Gunter that had travelled all over the world due to this profession but had immigrated to The States years ago. The soon to be performing next door Blues Brothers joined us and even the bar's bouncer called Pavel, that had a day off, seated himself next to us. Even he wasn't native to Iceland, originally from I believe Prague or Budapest. Awesome stories all around. The Blues Brothers invited us to watch their show, which we of course did and enjoyed immensely. We ended the night with a snack that I can't even remember what it looked like let alone pronounce. It was jummy though. Yes it's safe to say that we enjoyed Akureyri a lot! On our last day on Route 1 we headed out early again after packing our tents away. We got some petrol station breakfast and got ready for the ride back to Reykjavik. The weather on this day was probably one of the worst of the entire roadtrip, including the first day. 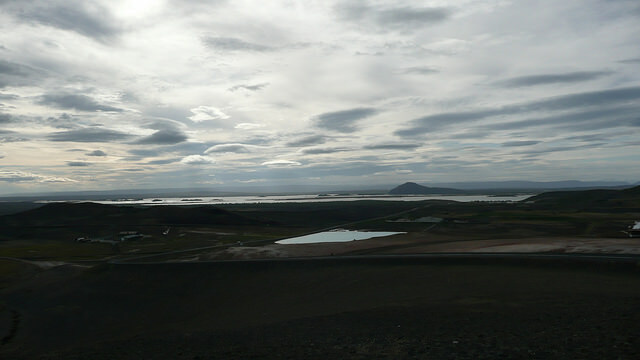 However moods were not deterred and we enjoyed the scenery. 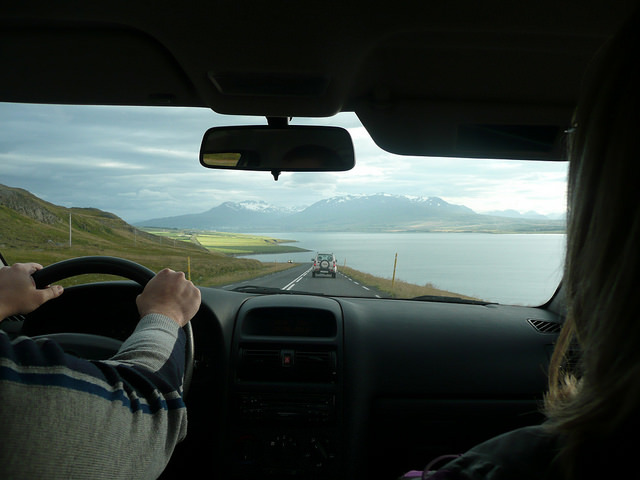 It wasn't a long drive to Reykjavik from Akureyri as we used the Hvalfjörður Tunnel which goes underneath the Hvalfjörður fjord that cuts a 1 hour journey around the fjord to 7 minute. 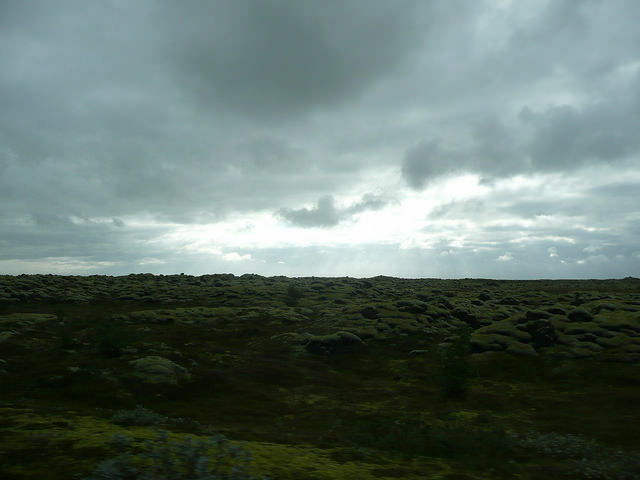 Soon enough we were back in rainy Reykjavik and had some time to kill. We dropped of the gasburner and canister I lent from Estelle. And got to walk along the dock area of the city. We even got the chance to visit a flea market. Something Adam was way more into then Chrissy or I for some reason. We had lunch and even the chance to visit a bar or two before we finally had to drive to the place I would be staying for the night. Even though our little "economy car" was reliable and comfortable during the entire trip, it was far from being good for the environment let alone for our wallets. Petrol prices being better than in The Netherlands with slight under a euro per litre but we had to fill up at least once a day, sometimes more. 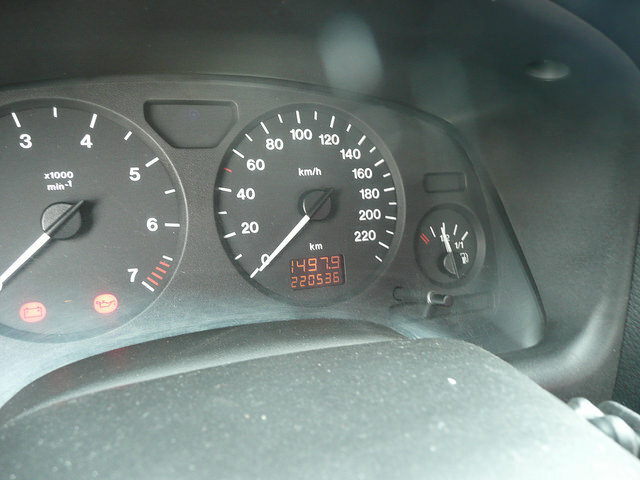 I guesstimate we did about 300 kilometres per tank (5 days / 1500 total km). Thanks a lot <a href=” http://www.faircar.is/” target=”_blank”>FairCar! I said goodbye to Adam & Chrissy and wished them a lot of fun in Norway as they would be flying there the day after. I however had a little more time still in Reykjavik, although only because I opted to stay in the city and they had to drop of the car near the airport. For my last night I stayed at my first Airbnb place. As I had booked quite late I didn't have many options and the ones available were somewhat expensive. Airbnb can be quite handy though. It's similar'ish to Couchsurfing, although chances are better that you'll get your own bed but I would consider that quite normal when you are paying for your stay. However you miss out on all the fun that you would normally get with Couchsurfing (CS). Sure you might actually end up sleeping on the floor with just a matrass or on a couch but that's part of the fun. On the other hand you might end up in a kingsized bed with your own bathroom, I had that on my second CS experience in New Jersey. But the best part of CS is the hosts you meet while you sleep at their place. It's just fun meeting people in general and somehow CS people are even more fun to meet. They tend to go out of their way to show you there neck of the woods and tell you the place you should definitely go see and you would often have missed otherwise. Inside knowledge is just great when it comes to travelling. A guide book often misses these subtle things. More photos/video from our roadtrip here.